Purple Turtle: Drone News Gathering in South Africa. South Africa, January 2019: Take newsgathering to new heights with the Purple Turtle Aviation Drone Newsgathering drone (DNG). Capture news like never before with bird's eye views. Purple Turtle Aviation and Communications SNG are proud to bring you our Drone Newsgathering (DNG) live broadcast drone services from South Africa. Drones are changing the way the world does things and TV newsgathering is no different. Most of the drones out there are designed for prosumers and not broadcasters which limits their usefulness. 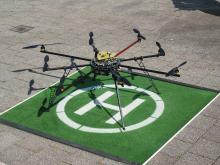 The Purple Turtle Aviation UAV Drone Services South Africa news drones are different; they are designed from the ground up for Live Broadcast Newsgathering in Full HD. Over 10 years' aviation experience. Purple Turtle AV drone services are not off-the-shelf generic drones; they are custom built for the broadcast industry’s needs and demanding requirements.